*A tour bus used by rapper 2 Chainz was loaded with guns and drugs when cops pulled it over in Oklahoma last month, according to new documents released this week. The rapper, real name Tauheed Epps, was forced to cancel his album listening party for “B.O.A.T.S. II: Me Time” in New York last month following the incident. Officers in Oklahoma City stopped the rapper’s tour bus after spotting a broken taillight. 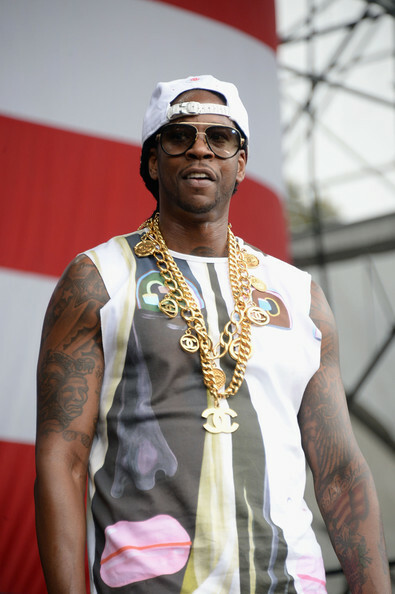 Eleven people, including 2 Chainz, were arrested after they refused to get off for nine hours. It has now emerged officers found two semi-automatic pistols and a 12-gauge pump-action shotgun along with some prescription painkillers and marijuana while searching the bus, according to documents filed in Oklahoma County District Court on Tuesday. Twenty shells for the 12-gauge shotgun were seized and prescription medications hydrocodone and Flexeril were also discovered. The 35 year old and his cohorts have been charged with obstructing a police officer and are currently free on $2,000 bail.